The Logatronic programmable mini-computer for invoicing was developed in the mid-1960s by the Nixdorf Computer company. The WANDERER logatronic is a computer for invoicing, statistical and accounting work. As a modern machine for offices and organizations it possesses all the essential features of electronic accounting systems. Advanced in conception, it points the way to new methods of office automation—methods which have so far been the prerogative of machines costing a lot more. With this computer the complex requirements of commercial, technical and scientific calculations are fulfilled. With its internal programming facilities, the WANDERER logatronic can be tailored to the needs of any type and size of business. Its capacity matches whatever task it is called upon to perform. It fits readily into every type of system and thus meets the precondition for direct, up-to-the minute data acquisition and processing. The advanced plug-in techniques used permit extensions and additions at any time to cope with changed organization. The programme store — which is the control centre of the computer — can receive and handle a number of independent programmes. Printed circuits, silicon transistors and complete elimination of relays and other moving parts subject to wear give the WANDERER logatronic practically unlimited life. The "memory" of the WANDERER logatronic consists of the required number — 4, 7, 11, 25, 60 or 120 — of magnetic core stores. Five internal working stores form part of the basic equipment of every model. The WANDERER logatronic makes logical decisions. It also compares values independently and draws the appropriate conclusions for the further progressing of the work. The error protection programming (ISP system) represents a large measure of protection from operating errors and ensures that the proper operating sequence is followed. A check digit comparison tests the values put in via the keyboard and checks the mutual dependence of terms of different kinds. The WANDERER logatronic is provided with alpha-numerical calling back of constants. 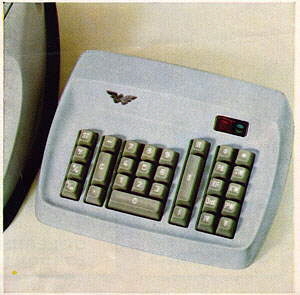 Selection of programmes, stores and constants is made via the keyboard. Voltage fluctuations and the action of switching the machine on and off do not affect the stored data. A wide range of models and peripheral equipment can be supplied to provide the right facilities for any application. Our experienced systems engineers are available to advise if required. All machines are backed by an extensive, first-class service system. A close-up of the calculator input unit. The drawer has been opened to show the electronic circuits. Desk of wood and steel construction, plastic surface to desk top ● Dimensions 55 X 28 X 30 in. (140 X 70 X 75cm). The Logatronic appears to have been developed further to become the Nixdorf Visible Record Computer. For information about Heinz Nixdorf, the company, and its computers see http://www.xnumber.com/xnumber/nixdorf2.htm.